Shady Acres Retirement Home—Dr. 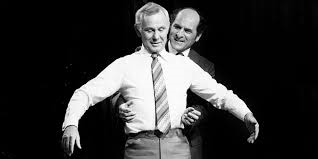 Henry Heimlich was in the news earlier this week after saving a fellow retirement home tenant from choking. More details of the incident are emerging that throw the famous anti-choke artist into a decidedly different light. According to witnesses, before Mr. Heimlich was able to eject the goods, a Lemony Snicket-like series of unfortunate events ensued. Dr. Heimlich is denying allegations he was hoping for such an event by paying kitchen staff on the side to serve unboned fish and extra-grisly meat. Dr. Demento was unavailable for comment.